Just mentioning a couple of books I read/am reading these days on the topic of parenting. (I still get a kick out of what a good parent I thought I was before I actually had kids to parent.) Now I'm re-reading, sifting, sorting and marinating myself in old and new titles to grow in wisdom as I parent my children. I'm still reading Seasons of a Mother's Heart , one chapter at a time, along with a group of moms. We meet monthly to talk through what we've learned. I previously mentioned *** that it kind of irks me that this book is titled to attract home schooling moms, because I think that's somewhat false and misleading in that the truths the book communicates could only be applicable to a home school mom. That is simply not so. It could handle a much wider audience, but for whatever reason, Clarkson focused on this group of women. We've completed reading the section on the "springtime" of motherhood (which is where I'm at) and are in the section discussing the "summertime" - which could be described as the pre-teen time to some extent. That seems to be how Clarkson is defining it for the most part. The thing that struck me as being the most interesting from the last chapter wasn't really a new idea for me to think about in terms of my parenting. Rather, I would say it was fresh encouragement. The idea she presented was that you should know your children, speak into their lives in a positive manner, and also take the time to build a home atmosphere wherein your children would be delighted to invite their friends over to hang out. You don't really want a home that is so cold, unfriendly and unwelcoming that your children's friends would prefer to spend their time elsewhere. Who would that benefit? Not you. Not your children. Not their friends. This is one idea that we're very much in favor of and we've purposed to grow in learning to be hospitable so that when our children go out into the world and start making friends for themselves, they will be eager to bring them home on occasion to be with their parents. That's a thought, eh? And a challenge for us even now because despite the fact that they are young, we still need to be about the business of knowing our children and what delights them so that we can be a positive influence in their lives. It starts now. Secondly, I finally got around to reading The Strong Family which Jonathan had read some time ago and I failed to follow up with. I really appreciate Swindoll's practical approach to ministry in that he makes a lot of practical life applications to scripture. 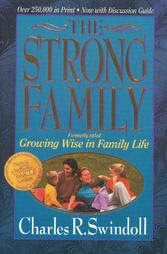 This book was originally published in 1998 under the title, "Growing Up Wise in Family Life" and then was republished under this current title. Er, well, it's not really current, now being out-of-print. Still, it's quite a gem and I'm happy to have read a copy of it. 1. (Not a new thought - just a fresh reminder...) All children are different. We know this in theory. We have our first child and we figure out (more or less) how to parent that one, right? Before we even begin to feel near the expert level of parenting, we have our second child and then we really get to talk about the Bible verse that says, "Train up a child in the way he should go..." Swindoll talks a lot about how that training up should vary according to the child and their particular gifting or "bent." Each child requires special, unique and tailored attention and that is something that we've both acknowledge in the past but now get to make some practical application for so the reminder was good. Noah went out and did something unusual. He built an ark, even though no one had ever seen one before or saw the purpose in it. Yet God had told him to build an ark and so build an ark he did! He did it despite the fact that his neighbors were laughing at him. Noah build the ark because he had faith that what he was doing was the right thing to do. He didn't listen to the criticism (although no doubt it hurt him because he was a human and did have ears and feelings) and he didn't give into laziness but stuck to the schedule and the task that God gave him in faith, believing. "Why is it so hard for us today to believe that God can still do the impossible? When did He stop leading people down unusual paths? As we've seen, His book is full of stories like that. And those in the inspired record who experience the fullness of His power stepped in with total obedience. Swindoll drives the point home - we should anticipate the unusual and we will have storms to weather as we fulfill the role that we have been given as parents. It is not always going to be easy. But God is faithful to lead and if I trust in Him, He will see me through the fiercest storm and the most unpleasant of situations - those that have already come and those that are yet to come. For my part, I really enjoy the challenge of continually picking up parenting books to read. I never want to fall into a position where I think I have it all together as a parent. That statement almost causes me to snicker, because who could ever think that they have it all together? Yet it's the human tendency and temptation to think we are All That and So Much More. If I am ever All That then God isn't my All in All and that's a place I never want to be. So it's back to the basics, back to the books and back to scripture and prayer to make it through today. Because today is all I have and the only day I can be good at parenting. We'll talk about tomorrow when it gets here. But I'm practicing for it right now. A quick little note on my remarks to Clarkson's book. If you click on the link I provided, you'll see what I mean when I make the comments that I wish Clarkson's book was not branded for home school moms because I think it will cause non-home schooling moms to not pick it up. And I think THAT is what is regrettable. I am not faulting Clarkson for creating a resource for home school moms. In fact, I think such moms will be drawn to the book much more quickly as a result. Certainly, it's Clarkson's perogative to do that if she'd like. I just think that it leaves out a wider group (of non-home schooling moms) who I think could and would benefit from the book without that label. It's a marketing thing I'm not sure is in the best interest of Christian moms in general but it's what it is. It is not my intent to slam Clarkson, but instead to point out the fact that this book is good for a broader audience that it looks like on its face. In other words - this book is so good I wish it were labeled differently so as to encourage a wider audience. I apologize for any confusion that my original wording might have brought upon the reader of this site. I'm leaving things as-is though because this post has already been viewed and I want to clarify and hopefully help you to better understand what I was fumbling about trying to say! I thought I had read the first one, but now that I think about it, I don't think I have. I read a ton of parenting books when my kids were young. In later years it wasn't so much that I thought I had it all together -- I still don't -- but there was less time, and as my kids approached the teens, the books written specifically to parents of that age group didn't resonate with me as much as books written to parents of younger children did. I only looked at one or two of the "parenting teen" books, though, so there may have been some out there I missed. But the churches we have been in have had a great emphasis on the family -- one of them took a whole month every year to teach about parenting in the Sunday School hour. That was such a big help. Have you ever read Elisabeth Elliot's Shaping of a Christian Family? It is not a how-to book as much as a testament to how her parents raised their kids. It is excellent, though there is some New Englandish staunchness I wouldn't adopt myself. Oh! You know, I haven't read that book by Elliot. The New England staunchness, as you say, is kind of off putting to me. But that doesn't mean that there aren't valuable truths to glean from Elliot and, in fact, I would have to say that reading her when I was a teen was probably excessively helpful to me as it helped me to discipline my behaviors and thoughts when it was necessary to do so. So I have an appreciation for Elliot, and I would be very curious to read that book. Thanks for reminding me of it! The Clarkson book is on my list. I have the Elliott book and it is great. All about her family of origin - how SHE was raised. Kids are so very different. As a mom of 4 with only 5 years between the oldest and youngest, their differences continually amaze me.